A Young Generation Sees Greener Pastures In Agriculture The average age of a farmer in the U.S. is over 58 and climbing. But in places like Maine, a growing number of under-35 farmers see an opportunity for better lives growing food for their communities. 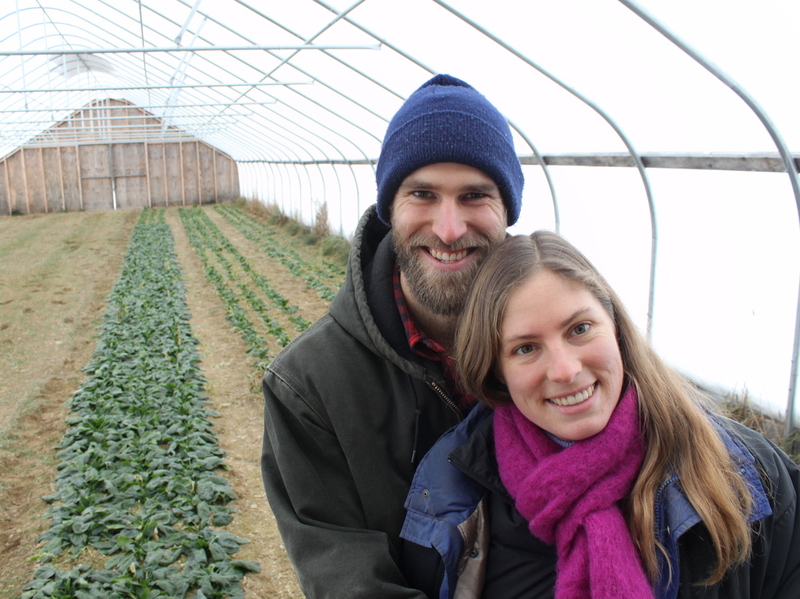 Marya Gelvosa and Josh Gerritsen run a small farm on Maine's rocky mid-coast, providing their local community with beef, lamb and heritage poultry. They're decades younger than the average American farmer, but they love the lifestyle. "It's very fulfilling work," Gelvosa says. America's heartland is graying. The average age of a farmer in the U.S. is 58.3 — and that number has been steadily ticking upward for more than 30 years. Overall, fewer young people are choosing a life on the land. But in some places around the country, like Maine, that trend is reversing. Small agriculture may be getting big again — and there's new crop of farmers to thank for it. On a windy hillside just a few miles from Maine's rocky mid-coast, it's 10 degrees; snow is crunching underfoot. Hairy highland cattle munch on flakes of hay and native Katahdin sheep are mustered in a white pool just outside the fence. Not far away, heritage chickens scuttle about a mobile poultry house that looks a bit like a Conestoga wagon. 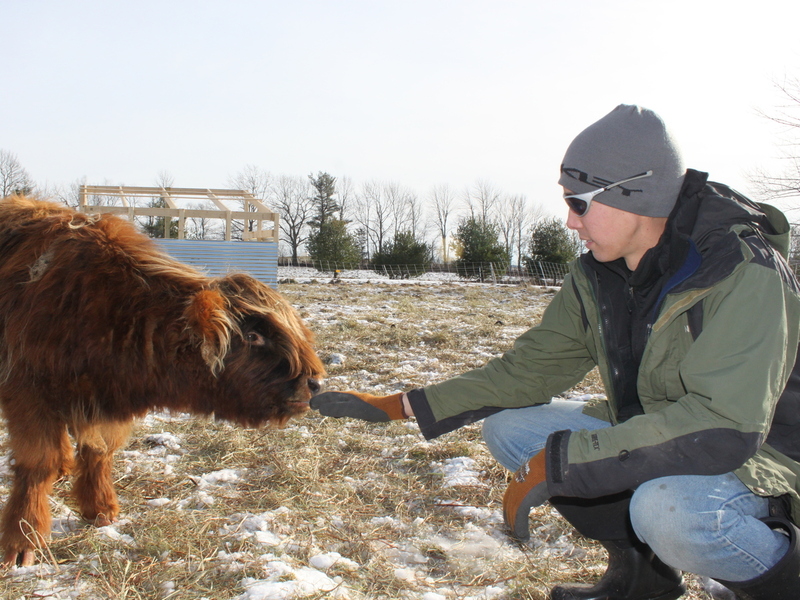 Josh Gerritsen reaches out to one of the farm's Highland calves. He says life in the city wasn't as satisfying: "You're not intimately tied to anything." Marya Gelvosa, majored in English literature and has never lived out in the country before. "Just a few years ago, if you'd told me that I was going to be a farmer, I would have probably laughed at you," she says. But Gelvosa and her partner, Josh Gerritsen, a New York City photographer, have thrown all their resources into this farm, where they provide a small local base of customers with beef, lamb and heritage poultry. Gerritsen says their livelihood now ties them to a community. "Living in the city, you commute by subway, you buy your food at the supermarket, you work in a cubicle all day," he says. "You're not intimately tied to anything." Gelvosa and Gerritsen are part of a generation for whom global warming has been hanging overhead like the sword of Damocles. In fact, all the young farmers interviewed for this story mentioned environmental health and climate change as factors in choosing a life on the land. It's a generation that has grown up in the digital age, but embraced some very old-school things: the farmers market, craft beer, artisan cheese. The point, they say, is to find a way to live high-quality, sustainable lives, and help others do the same. "It's very fulfilling work," Gelvosa says, "and noble work." Marya Gelvosa, 29, didn't grow up dreaming of being a farmer — in fact, as of a few years ago, she'd never even lived in the countryside. 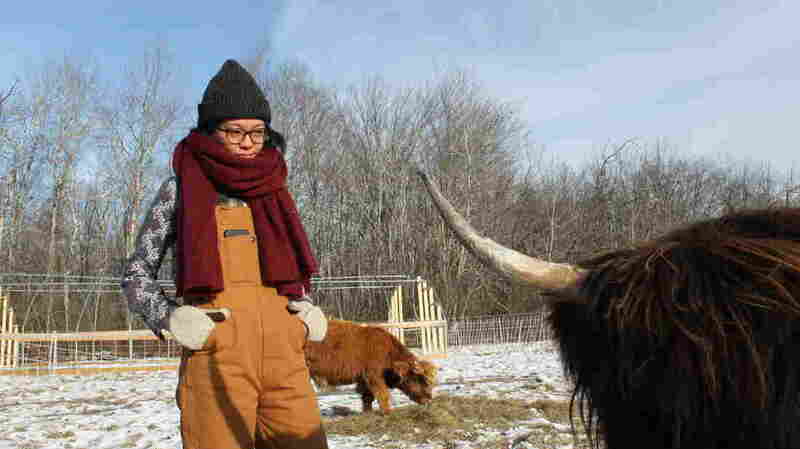 Now she and her partner Josh Gerritsen raise Highland cows and pastured eggs for a living. In Maine, farmers under the age of 35 have increased by 40 percent, says John Rebar, executive director of the University of Maine Cooperative Extension: "Nationally, that increase is 1.5 percent." And young farmers are being drawn to other rural Northeastern states as well, he says. Maine, New Hampshire and Vermont were all hotbeds of activity during the previous back-to-the-land movement of the 1970s. Many of those pioneers stayed and helped create farming and gardening organizations that now offer support and encouragement for new farmers. The social climate now is very different than the one Rebar encountered 30 years ago when he himself was an aspiring producer of cattle and sheep. "I was called 'Farmer' by my classmates in high school. That was okay with me, but you could tell it wasn't a term of endearment," he says. "There was a lot of negativity about encouraging young people to go into farming. "So it's a cultural shift that says we value this as part of our society. We want this to be part of our social fabric, so we're going to figure out ways to make it work." Part of making it work means access to land. On their coastal farm, where acreage is more expensive than it is inland, Gelvosa and Gerritsen say they're luckier than most; Gerritsen's parents had bought the property years before, which made starting up for the couple a lot easier. In Iowa, farmland prices are inching toward $9,000 per acre, which has some financial experts talking about a farmland bubble. 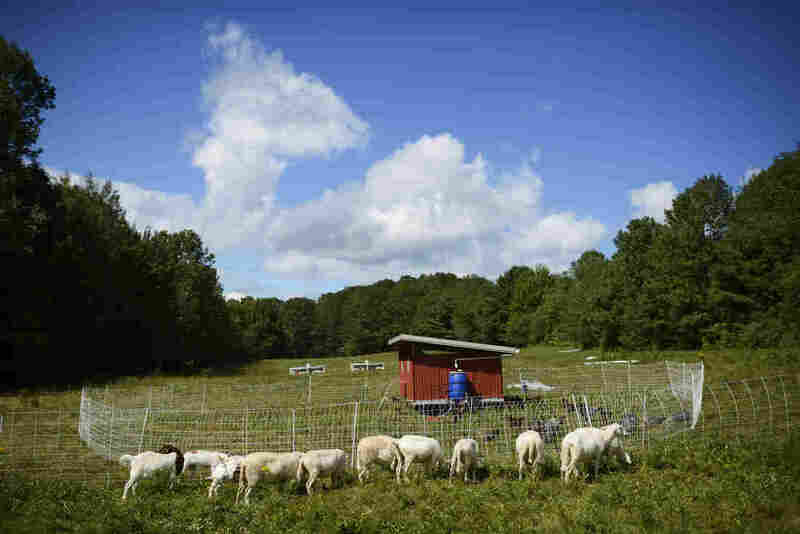 But sparsely developed states like Maine still possess affordable lands, which savvy young farmers with a little money — and a lot of elbow grease — are starting to acquire. Gene and Mary Margaret Ripley are just such a pair. In what's often cited as one of the poorest counties east of the Mississippi, they paid less than $200,000 for a full house, barn, eight acres of hay fields and enough land for their organic vegetable business. Buying land is a challenge for many young farmers, but Gene and Mary Margaret Ripley found an affordable property in Maine. This high tunnel lets them produce cold-hardy crops like spinach into mid-winter. The whole property amounts to 38 acres, Mary Margaret Ripley says, mostly woods. They planted 2.5 acres of cash crops in the most recent year. "We are getting to the point where demand is outstripping our supply and so this year we cleared a one-acre section of woods right here," Gene Ripley says. "Just last week, which is really exciting, we just hired our first full-time employee, who is going to be starting in the spring." "This is about creating something. This is about building something themselves. This is about using their two hands to make a difference," Rebar says. And, he says, this new generation of farmers have made farming cool again.